Seminal power trio Rush is back on tour in support of their latest release, Clockwork Angels. Recently inducted into the Rock n' Roll Hall of Fame, the band is rewarding fans with a vastly different setlist and show than was featured on the 'Time Machine' tour. 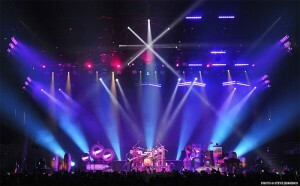 In similar fashion, lighting designer Howard Ungerleider created bold new visuals with High End Systems Intellaspots and a host of other fixtures to punctuate the steampunk inspired themes of Clockwork Angels. Howard explains: "When the band finished the recording, I had the opportunity to go in for a listen and was just blown away. I had already designed the backbone of the system; because it was called Clockwork Angels and was steampunk themed, I decided to create something angelic. Angel wings were in my design head, and I wanted something in the rig to move like an angel, so I designed those trusses with the video panels on them. Surrounding those I put in a dozen custom designed Lightlock stabilized mini-pods. They are free hung, and work in conjunction with what I call the satellites - the panels that are articulating with the video screens. So I had a lot of moving parts to replicate the angels flying. After having the opportunity to hear some tracks, I was then inspired to blend all the ideas that I had, and asked them to send me the lyrics and the storyline. At that point I was able to really get into the design of the rig and finish it off." Howard's angelic grace of movement on the show is juxtaposed with the over-the-top video treatments that have become a staple of the Rush concert experience. Alan Weinrib and Dale Heslip are the core creative team behind the videos, with Geddy and Howard also brainstorming new concepts. "I put my two cents in," says Howard, but for the most part I make sure that the coloration and the integrity of what's happening on the screen will blend with what I'm designing, so the video and the lighting complement each other. For the live aspect of it, our video director David Davidian launches many of the videos from behind the stage, and I'm launching a lot of them through Catalyst servers. We took the saturation to a steampunk vibe to give it a different feel, and put film scratches on the black and white - all sorts of little tricks to create this atmosphere." To facilitate Ungerleider's angelic movement concept, 32 1-ton Vario Hoists from Show Distribution allow precise control of the mini-pods and satellites. John Fletcher from Five Points Rigging is the tour's head rigger, while motion control is overseen by Sebastian Richard. Howard runs the show on a High End Systems Hog 3 Full Boar console, while his new assistant Andy O'Toole operates an identical system. "We have duplicate setups," explains Howard. "I run the show on the expansion wing, and if something were to go awry on the main console, Andy can get in there to fix it - and we don't have to stop the show to do it. He's also controlling the cryogenics from that console, as I don't have enough hands to do it all!" To create the gorgeous spectrum of lighting effects that adorn the show, Ungerleider is using a veritable cornucopia of automated lighting tools. The lighting package is supplied by Premier Global, and includes 24 High End Systems Intellaspots, seven High End Systems Showguns, 10 Vari*Lite VL3500s, 55 Clay Paky Sharpy fixtures, 48 Robe Robin 600 LED washes, 24 Martin MAC 3K strobes with scrollers, 10 Coemar ACL and 28 Infinity Wash fixtures, 44 Color Force 48 LED strips, 20 PixelLine Maxi Wash and six Lycian M2 spots. The LD says the Intellaspots are his hard-edge fixture of choice for this tour. "I'm using 24 Intellaspots as the workhorses and backbone of the system," he points out. "I love that they have an animating effect and an animating wheel, and I love the LEDs on the front - that's a beautiful thing. I can put them at 40 feet, and they don't drift away like some other light sources that start petering out at higher trims. The Intellaspots are just rock solid. They're amazing fixtures, and very underrated. Also, having Tim Grivas as my programmer gives a distinct advantage, due to his familiarity with what I like and am trying to achieve; once again things worked out very well." The seven Showguns are placed across the floor, creating a signature punch that Howard employs for sheer power and intensity. "I use the Showguns for sculptural effects and setting up geometrical patterns, and as a powerful timing tool," says Howard. "They're so bright and so sharp. Their throws are amazing, it just helps tie it all in. Whether used on the ground or in the air, I just happen to love the look of the Showguns; they add sculpture to my designs." 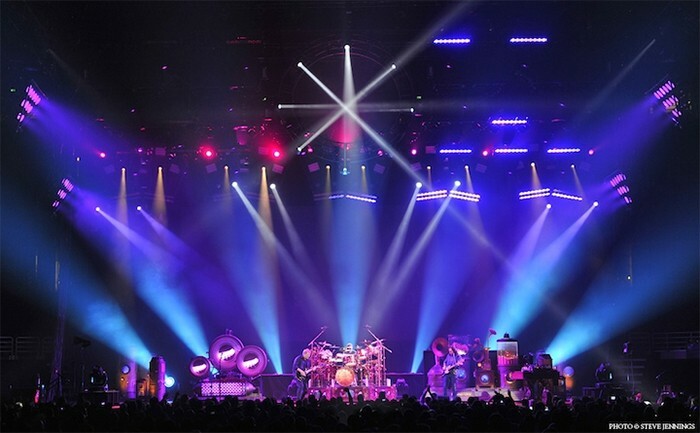 After designing concert lighting for Rush for more than three decades, Ungerleider still embraces new technology and techniques to create a truly memorable sensory experience for the fans. "I do try to change it up a bit and stay on the cutting-edge of what's going on," he says, "and I also save many of the surprises for the second half of the show. That's the beauty of age; I've developed the wisdom over the years to be able to hold back. It's a three-hour show, and you don't want to blow your cookies by the third song! I'm choreographing lighting to the music, and also choreographing lighting to lyrics. Because it was a concept record this year, they wanted me to tell a story in a certain way with light. People come up and tell me, 'it's an old school lighting technique with new school components'. I have to thank my crew and vendors; this is the best support team that I've ever had, and it's been an amazing experience."